Vaccines and autism: Antivaccination group advertising on billboards. The National Vaccination Information Center is a group that has an official-sounding name, one that might make you think their message is trustworthy. Except, not so much. Or at all. Or really just the opposite. NVIC is an antivax group, plain and simple. Despite hugely overwhelming tsunami-level amounts of evidence showing no link between vaccines and autism, they still think there is one. They go on and on about “vaccine injuries”, yet actual severe side effects from vaccines are very rare, especially when you realize that many millions of vaccines are given every year. The NVIC relies on anecdotes of injuries as evidence, but that’s very dangerous thinking. Stories and personal observations are a good place to start—it’s how you might notice a connection between two things—but it’s not where you end. You must apply rigorous testing to your ideas, so that you can make sure you’re not seeing a connection where none exists. The vaccine injured community is composed of people, young and old, who are suffering from a spectrum of chronic illness and disabilities, including learning disabilities and developmental delays, attention deficit hyperactivity disorder (ADHD), autism, seizure disorders, mental retardation, diabetes, asthma, inflammatory bowel disease (IBD) rheumatoid arthritis, multiple sclerosis and other kinds of neuroimmune and autoimmune dysfunction. That litany of effects is interesting, given that to the best of my knowledge (and I’ve looked) none of them has actually been linked to vaccines in real medical studies (and their claims of links to IBD sound like they’re still promoting Andrew Wakefield’s long-debunked claims). NVIC plays up vaccine fears with a vaccine “ingredient calculator” that noted health advocate Orac called “deceptive” and “disingenuous”. Got your irony gland protected? Their President, Barbara Loe Fischer once stated she wanted a “fearless discussion” about vaccines, yet she sued a reporter who wrote a negative article about NVIC. I could go on and on. Needless to say I don’t hold NVIC in the highest regard. 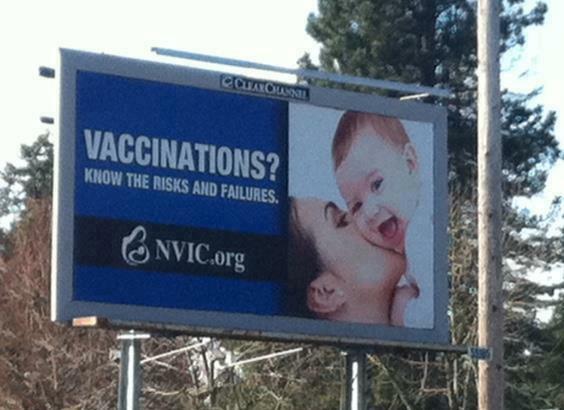 One of the antivax billboards paid for by the NVIC. Why is this misleading? Because, as Todd W. from Harpocrates Speaks points out, they don’t mention the benefits. Everything in medicine is tradeoff between risks and benefits. In the case of vaccines, though, the benefits hugely, overwhelmingly outweigh the risks. If you live in the U.S., try to find someone who has polio. Or go anywhere in the world and see how many folks suffering from smallpox you can find. You won’t find any: after killing hundreds of millions of people, smallpox was eradicated in the wild in 1977. Guess how. Saving millions of lives is a pretty good benefit. I’ll note that the documented evidence for serious adverse reactions to vaccines is low, especially compared to the benefits as a whole. It has come to my attention that the antivaccination organization NVIC is advertising on your billboards. NVIC promotes dangerous misinformation about vaccinations, using outdated and simply wrong information trying to tie vaccines to autism and other health issues despite overwhelming scientific evidence against them. To be frank, this puts people—including babies—at risk of contracting preventable diseases like pertussis, measles, and the flu. I have written about the NVIC and you can find more about them here and here. Delta airlines ran NVIC ads last year and rightly found themselves in the middle of a lot of controversy and bad publicity because of it. I am asking you to take down those NVIC billboards, and also review your policies on what organizations can and should use your venues to promote their own work. Clear Channel has a contact page. If you agree with me, please write them a brief, polite note. This is a billboard I approve of. Image credit: Every Child By Two, a pro-health group. Antivax thinking can cause a vast amount of damage. We are seeing outbreaks of all manners of preventable diseases like pertussis, measles, and more because fewer people are getting vaccinated. We need to maintain a high rate of vaccination to invoke herd immunity, where there aren’t enough places (that is, human bodies) for a dangerous virus or bacterium to live. This greatly reduces the spread of the disease to other people, including babies and immunosuppressed people (like folks with rheumatoid arthritis or who are getting cancer treatments). Getting vaccinated won’t just help you stay healthy, it may save the life of people around you. Talk to your board certified doctor, and if they recommend it, make sure your vaccines are up to date, including boosters. Knowledge, evidence-based and critically examined knowledge, saves lives.